Just days after New York celebrated the swearing in of MaryEllen Elia as it's first female Commissioner of Education, a statewide teacher group addressed an open letter to her, unpacking a litany of thorny issues that dogged her predecessor to the point where he avoided public appearances. Welcome to your new office, where we hope to begin meaningful open discussions about the harms of standardized testing in education policy. New York needs a commissioner who will listen to students, parents, educators and taxpayers and "show your work" so the public can understand the decisions made in the Department. 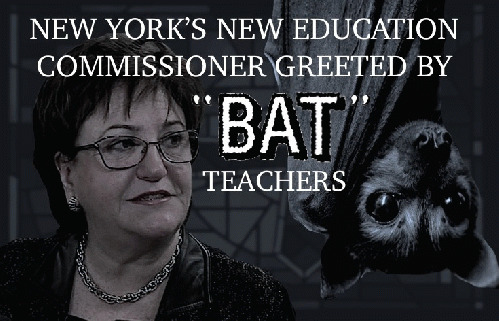 NY BATs are the state chapter of the 55,000-strong Badass Teachers Association, formed two years ago. NY BATs is the largest state chapter with over 3,300 member educators and we are vocal members of our local communities working to inform state and local policymakers on the in-classroom consequences of policies influenced by so many non-educators. WHY CAN'T YOU BE LIKE SUZIE: The most basic philosophy driving NY's Common Core implementation says that if all learners within a one-year age range do not test in math and ELA on par with college-bound high achievers on pace to exceed an SAT score of 1600, then their most current teacher is to be held accountable, invoking a ladder of punishments. But established science in the field of child development has always cautioned educators that the individual pace of physical, cognitive, expressive and social-emotional growth in individual children naturally varies widely, due to a host of factors. So we have our first clash between reality and policy. Where do you stand on government mandated benchmarks for child development? LET'S RUN SOME TESTS: For well over a decade, NCLB has promised that paying outside vendors to administer tests will somehow help low-performing schools, but as the measuring has increased in cost and scope, in-classroom support has never come. Instead, we've seen threats and sanctions for schools which hinge on provably inaccurate metrics. All along, Census data alone was sufficiently showing policymakers where to direct aid. But helping impoverished kids was never the true goal, it was the testing itself, awarding billions annually to contractors who fund political campaigns. Where do you stand on the pay-for-play that has compromised the independence of NY's education policymakers? FEEL LUCKY? Multiple choice questions allow a one in four guess of a correct answer, even when the question has not been read or understood. This alone introduces wholesale inaccuracy into a formula supposedly measuring the ability of individual teachers. Whether it's informed guesses or purely random, are luck and chance acceptable in professional assessments informing personnel decisions? THE SUPER-TEACHER: NY's growth measures also elude scientific reliability by ignoring home-based factors that increase or impede learning. For example, if a family hires a team of private tutors to help a child make gains in math, APPR blindly credits the classroom teacher. Even when tutoring is subsidized by the state, there is no accounting for which students partake, or for how long, throwing outcome-based comparison into the arbitrary. Similarly, academic help that comes from mom, dad, peers, previous teachers or even Khan Academy goes untabulated in a system that looks only at the last teacher in the room. EYES CLENCHED SHUT: Conversely, if a student is abused at home, causing their ELA scores to plummet, we fault their classroom teacher in a "no excuses" landscape built on shutting out reality and individualized attention. Giving only lip service to social-emotional factors, the purveyors of VAM devised "norming" schemes, grouping students together in three categories - English learners, students with disabilities and students living in poverty. LUMPING KIDS TOGETHER: Because there are no graduated scales for these catch-all designations, they massively broad-brush students. ELL status lumps together those who have been practicing English for years with those who don't know a single phrase. IEPs vary broadly from high and low functioning ability, making this designation mask as much as it reveals. Similarly with impoverished students, variances high and low are mushed into one monolithic checkbox. NY's version of VAM, called APPR, has it's official Technical Report for Growth Measures (2013-14) document here. APPR aggregates and tracks the percentages of ELL, IEP and impoverished students without explaining how this is "considered" in ranking scores. It also disregards factors like chronic absence or how many aren't even trying on test day. APPR acknowledges "peer effects" in the trajectory of students in schools with high proportions of ELLs, but ignores critical obstacles to learning, such as drugs or gang activity, court-involved families, homelessness, transience and more. Some of NY's neediest students are in educational crisis due to loss, or trauma such as abuse or neglect. Factors like this are crucial because the ripple effects affect entire classes, grades and schools, monopolize resources and can slow learning every period of every day. THE BIRTH LOTTERY: From conception, factors like nutrition and the home environment shape ability and the pace of a child's cognitive and expressive development. Children read to by parents and exposed to rich vocabulary and cultural experiences have obvious advantages over kids with unstable home lives, toxic stress, housing or food uncertainty, incarcerated family members, or other real-world considerations not acknowledged by APPR. GROWTH INACCURACY: Performance by different student cohorts naturally varies greatly from year to year. Yet APPR purports to measure "change in learning between two points in time". But when we use a student score achieved with one teacher as a baseline to measure the next year's scores under a different teacher, it's an uncontrolled variable. So a teacher who happens to follow a below-average teacher is rewarded, while a teacher who follows an above-average teacher is punished. This creates perverse incentives to work one grade above a horrible teacher in the same subject, and makes teachers avoid following great teachers, in order to game a system they don't believe in. The desperation caused by high stakes and the greed associated with cash bonuses remind us how often schools showing the greatest gains turn out to be the subject of cheating investigations. TOXIC TEST SCORES: NY's evaluations make it harder for inner city schools to hire good teachers. Candidates know they'll be held responsible for predictably low scores, so they seek other schools (or leave the profession). In protest, some NY districts don't show teachers their scores, or inflate observations scores to compensate, shielding teachers from arbitrary and capricious test-based rankings. "The results of growth models are used to measure the effects of educators on student learning gains, taking into account a student's prior achievement; however, some factors outside of an educator's control may impact student learning gains. For example, different learning trajectories are often statistically related to students living in poverty, beyond what would be expected based only on the student's prior achievement." In the impending lawsuit by Long Island teacher Sheri Lederman, APPR is now headed into court, (hopefully to be debated by qualified experts without financial stakes linked to their opinions). But even the layman can see curious practices. For example, on page 3, we see that students have their math and ELA scores combined together. Can you explain why?